When I bought my house a couple years ago I noticed the mirrors in the main bathrooms were damaged around the edges. My first thought was I needed to replace the mirrors. But recently I was browsing DIY bathroom renovations on Pinterest and came across blog posts about building frames for bathroom mirrors. I liked the rustic look of these DIY mirror frames so I decided to take a crack at it. Here’s an example of the damage around the mirror edges. I’m not sure what causes this. Regardless, a frame seems like the perfect way to hide it while also updating the bathroom decor. The first step was to measure the two mirrors I wanted to frame. I decided to build my frames about half of an inch taller than what I measured so I could mount them on drywall anchors just above the mirrors. 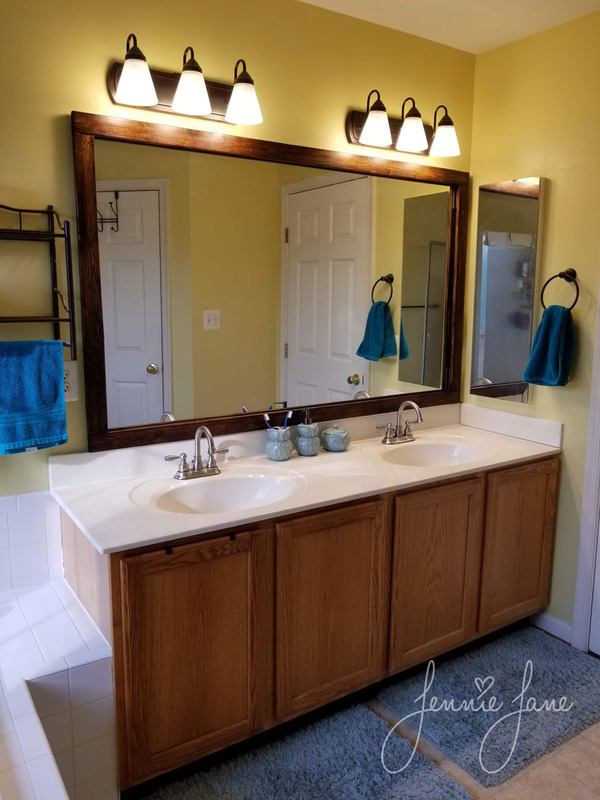 Some blog posts suggested gluing the frame directly to the mirror but I wanted frames that could easily be removed if I decided to repaint the bathrooms or upgrade the vanity tops. The posts I read used 1 in. by 4 in. boards to make their mirror frames. 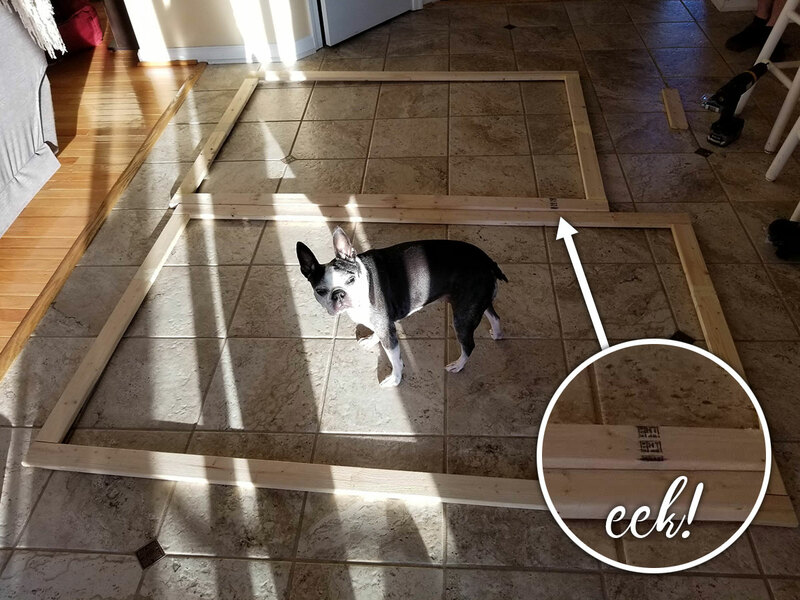 After reviewing options at the hardware store, I decided that 4″ was too wide, and 1″ x 3″ furring strips were better suited for frames. 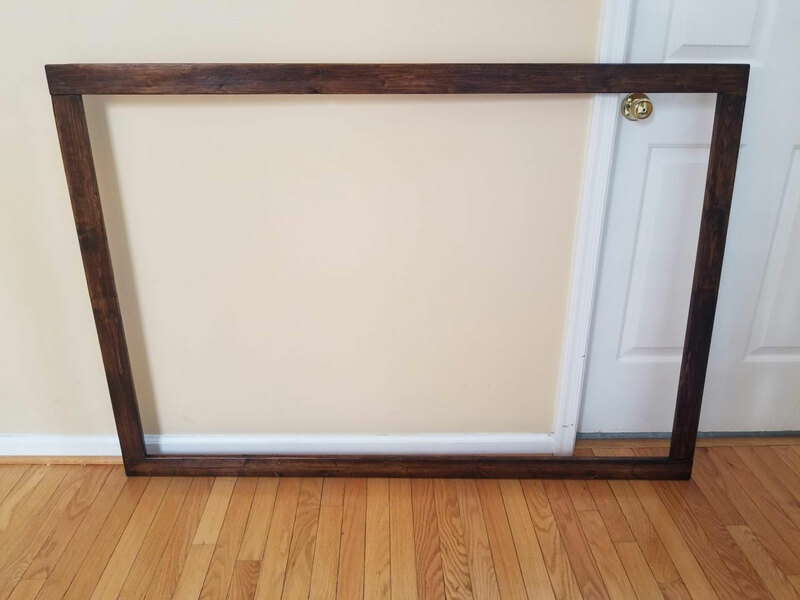 They are also cheaper and the quality is not as good, but they work well if you want your finished frame to have a rustic look. NOTE: Wood from the hardware store has an “actual size” that you’ll need to pay attention to when measuring. The furring strips were really only 2.5″ wide so I had to account for that in my measurements. These are my favorite drywall anchors because they don’t require pre-drilling. These are the hangers I used to hang the frame on the drywall anchors. They nail directly into the wood. Since my furring strips were slightly warped, I used these hook and loop Command Strips in the bottom corners to secure the frame to the mirror and keep it flat. 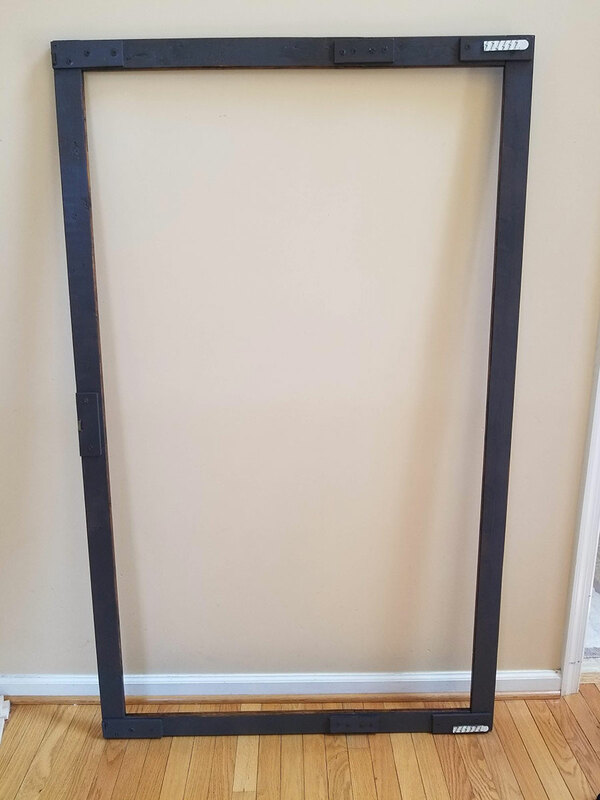 After seeing the completed mirror frame only weighed 4 lbs., I realized I could have attached the frames to the mirrors using only Command Strips. 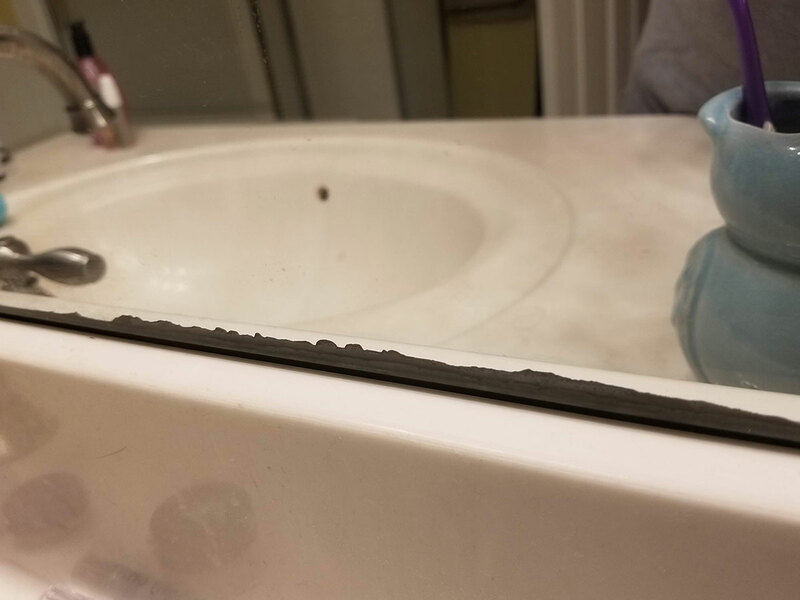 The post I read on Cherished Bliss uses mitered corners for their mirror frame. I don’t have a means of making really nice miter cuts so I steered away from this design. Tag & Tibby’s version of the mirror frame does not have mitered cuts and uses blocks of wood to secure the corners. In this version I didn’t like how far this mirror sticks out from the wall. So my solution was to use a thinner, rigid material to secure the corners. I first tried tie plates but they weren’t sturdy enough. I also considered using decorative L straps on the outside of the mirror, but they were too expensive for my budget. The fiber board was cheap, sturdy, and relatively thin, so I cut it into small panels to attach to the furring strips. This stain was cheap at the hardware store and claimed to be both color and sealer in one. I’m a sucker for one-step painting products! The downside was there weren’t a lot of color options at the store. Amazon has more options to choose from in small cans. 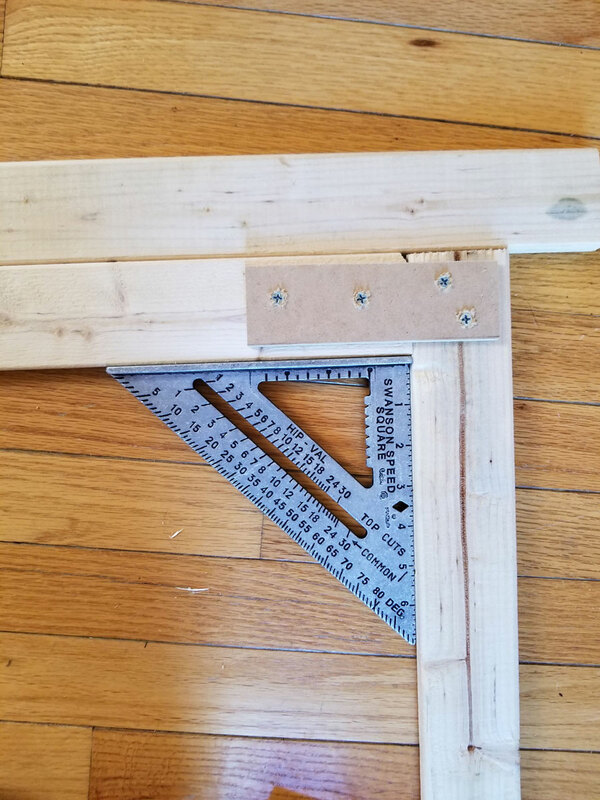 If you also want to do this non-mitered style of frame, you’ll also need some wood screws that are long enough to penetrate the material you’re using to join corners and the boards beneath. I asked an employee at the hardware store to cut my furring strips to size but he messed up almost every cut. I didn’t want to waste material or money, so I used cuts of fiber board to join the furring strips, re-measured and re-cut them to size with a circular saw. At the top you’ll see I had the idea to use wood filler in the seams, but it was a useless step and the seams still show. The final frames have a rustic and reclaimed look so the visible seams on the front look fine, especially since I used a dark colored stain. 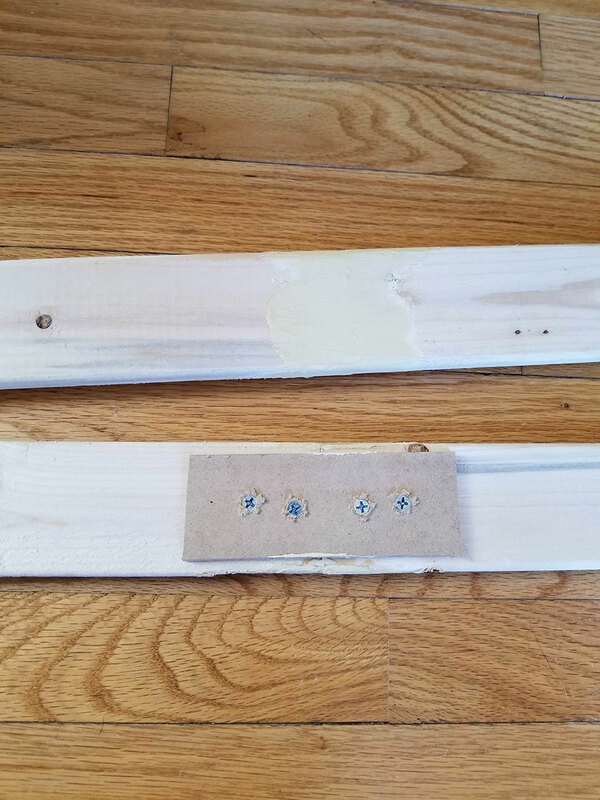 When joining the perpendicular boards I used my handy speed square to make sure the corners were good, and attached strips of fiber board with wood screws. Here’s a picture before staining, with the foreman (a.k.a. my dog) supervising. You can see that I goofed and the front side of the mirror has one of the lumber stamps. Eek! Luckily it’s not visible after sanding that area down and staining. I used my orbit sander to sand down the frames before moving on staining. After staining you can hardly see where I seamed the boards together and the knots and grain of the wood look pretty nice! After mounting the mirror frame, I decided I should have stained the back side as you can see it through the reflection of the mirror. To get the project done faster I painted the back with brown paint and it looks fine in the reflection. In the bottom corners you can see where I am using the hook and loop Command Strips to help keep the frame flush to the mirror. Here’s a shot of the mounting hardware on the back of the frame. First I screwed on pieces of fiber board to match the depth of the corners on the frame. Then I nailed in the sawtooth hangers. I have three along the top edge of each mirror, but honestly since the frame is so light, two would have been sufficient. 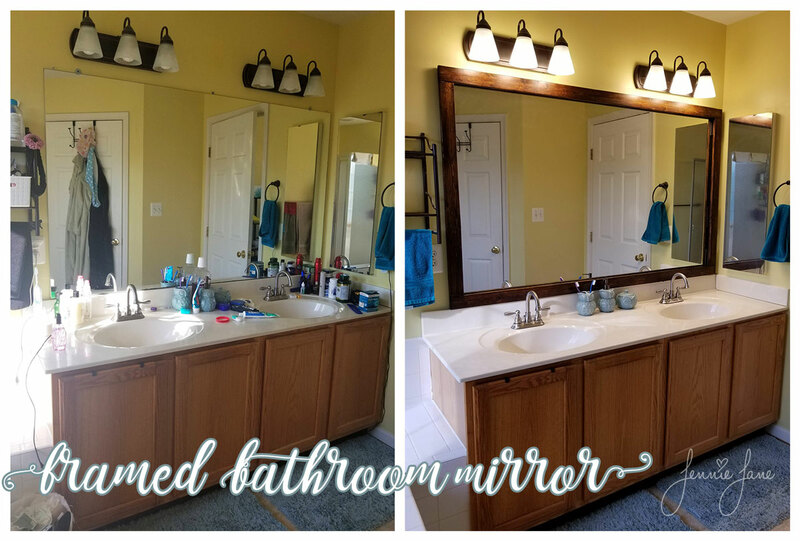 The mirror frame makes a huge difference to the appearance of my master bathroom! I really love the way it turned out, and it was a relatively easy project to complete. If I could do it over, I would measure 5 times and make every cut myself. 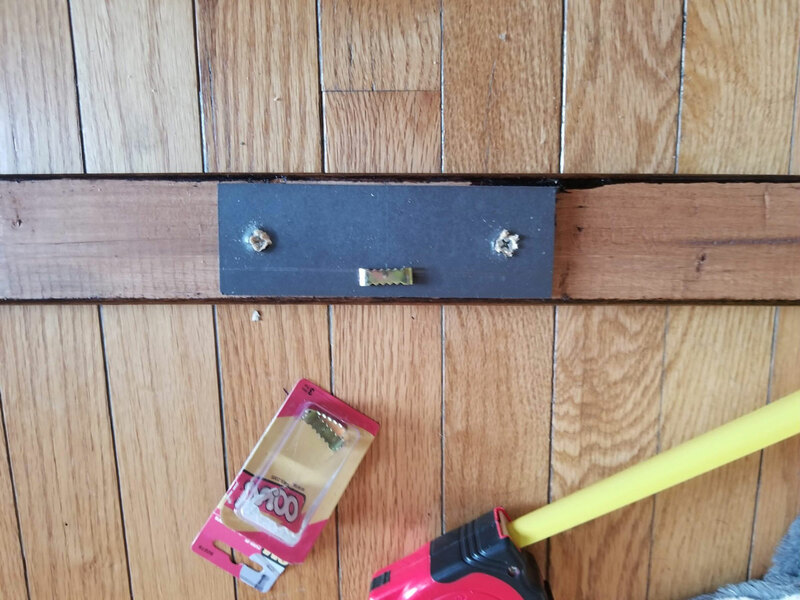 I would also skip the drywall anchors and mounting hardware and just use hook and loop Command Strips. In this picture you can see where the back of the mirror frame shows in the reflection. This is why I took the frame down and painted the back. 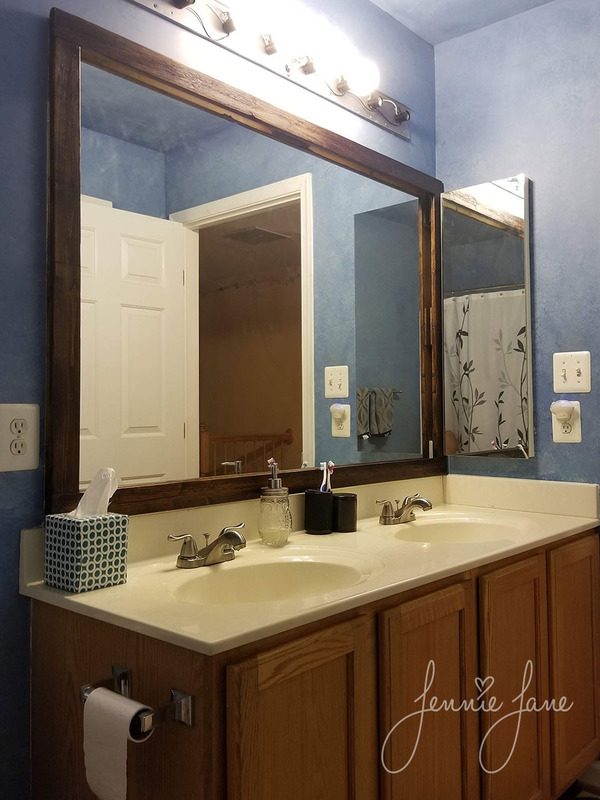 This bathroom needs a lot more updating but the rustic DIY mirror frame is a great start! Have you built your own mirror frames or thinking about taking on this project? Let me know what you think in the comments below!